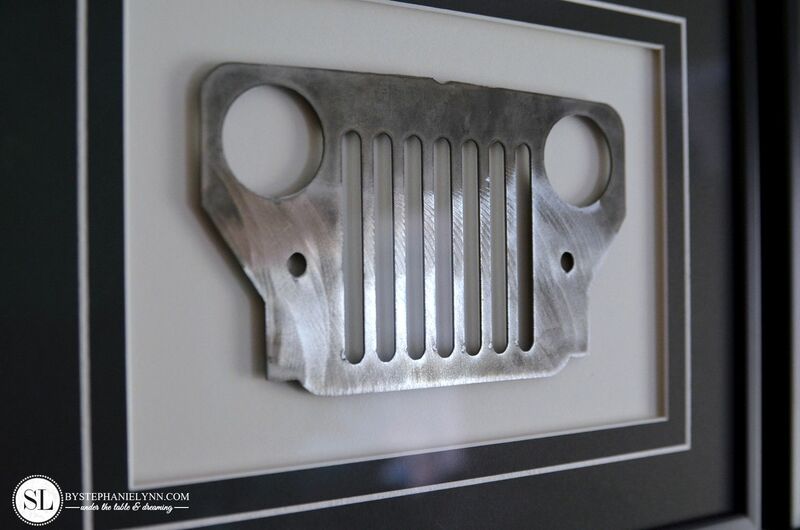 Framed Jeep Grilles – mini replica custom wall art | Sixteen years ago we made a phone call and purchased our first Jeep. A well loved CJ-7 we found sitting on the side of the road. Little did we know that one purchase would be the beginning of a whole new lifestyle. 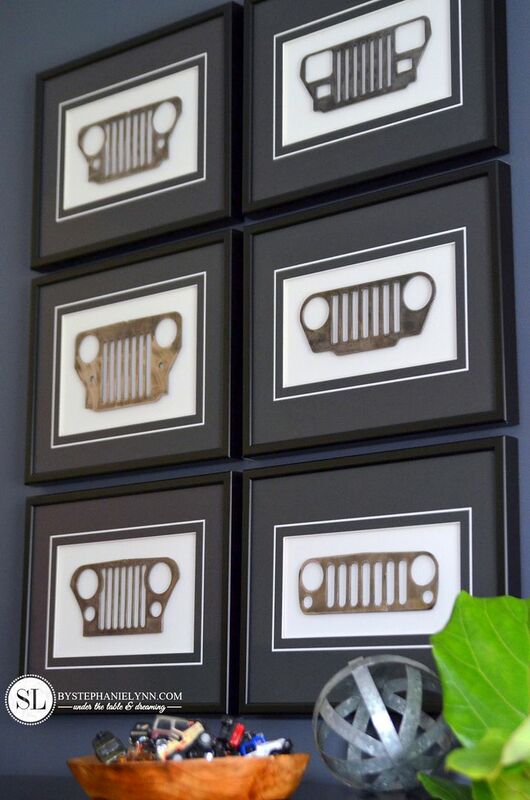 They say when you own a Jeep, every other Jeep owner in the world is your friend. That special camaraderie and ‘go anywhere, do anything’ community has given us years of outdoor adventures, wonderful memories and an incredible group of friends, we now think of as family. 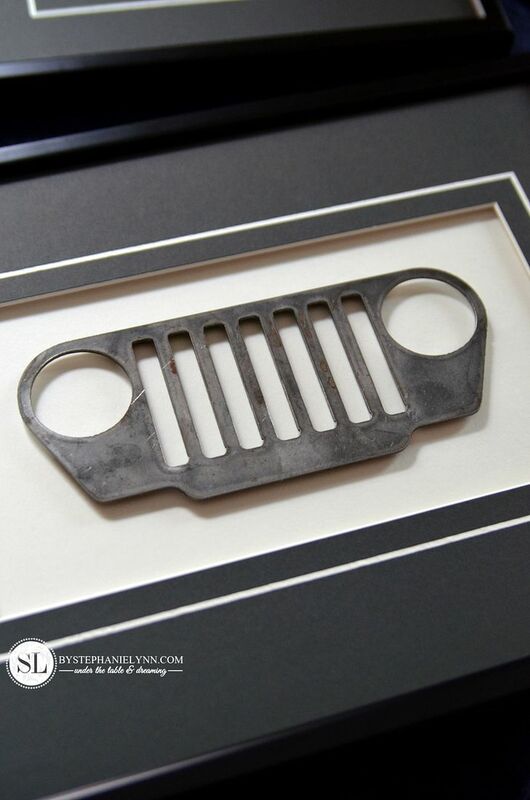 I share all of this because, without sounding cliche, if you don’t own a Jeep you may not completely understand just how much this iconic American brand has become a part of our life. 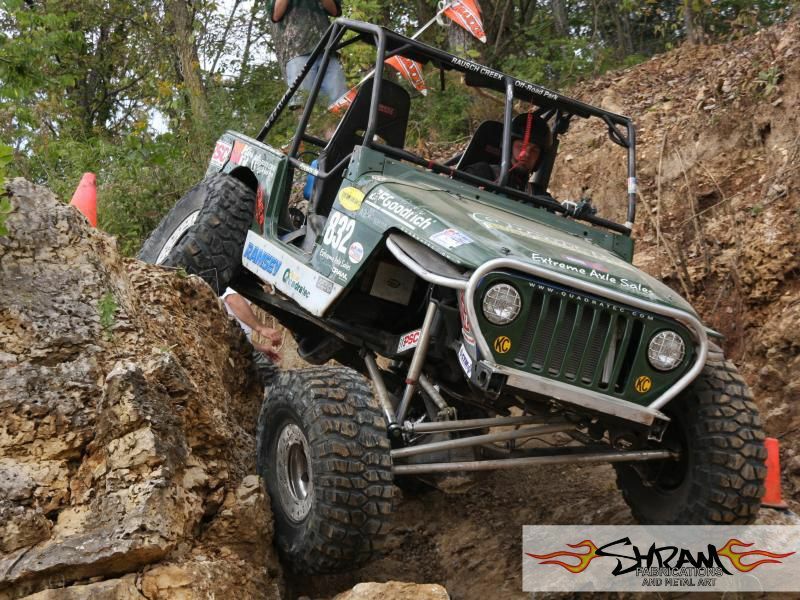 To this day, no matter what we are doing, one of our Jeeps always seems to be a part of it. 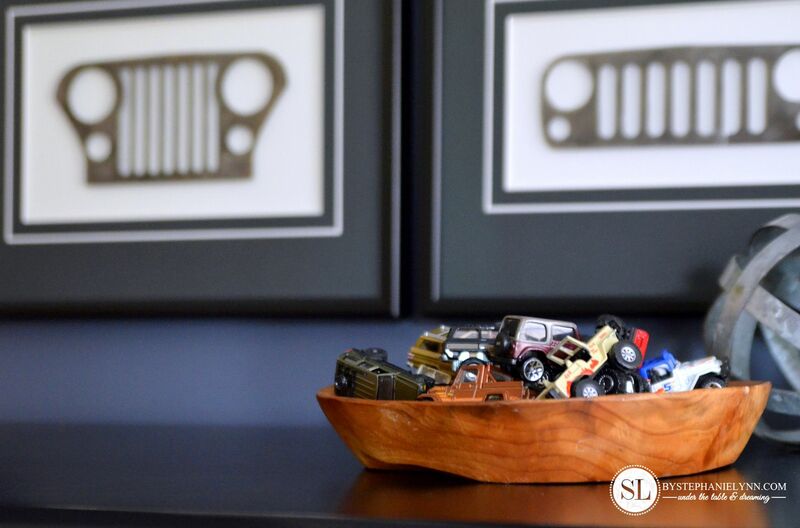 So when choosing some art for our little guys room it was only fitting to incorporate a little piece of off road history into the mix – His name is CJ after-all. 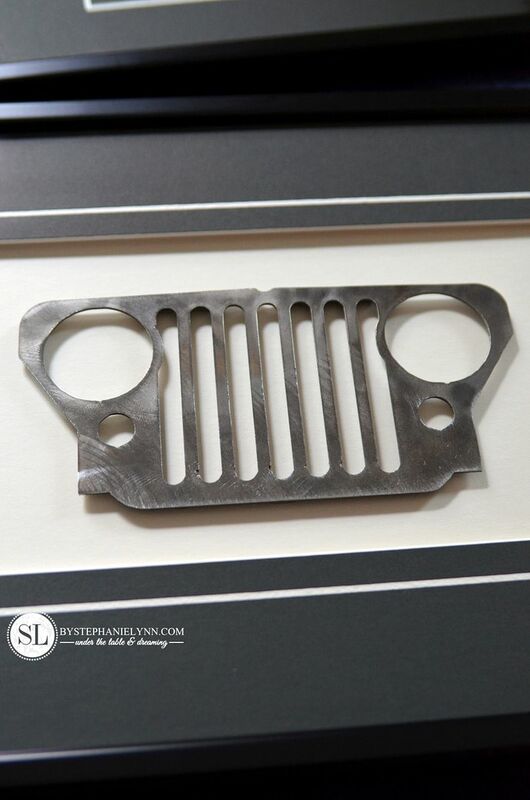 I contacted one of our long time buddies, Kurt Shramovich – a fellow Jeep enthusiast, former rock crawling champion, and owner of Shram Fabrications and Metal Art. 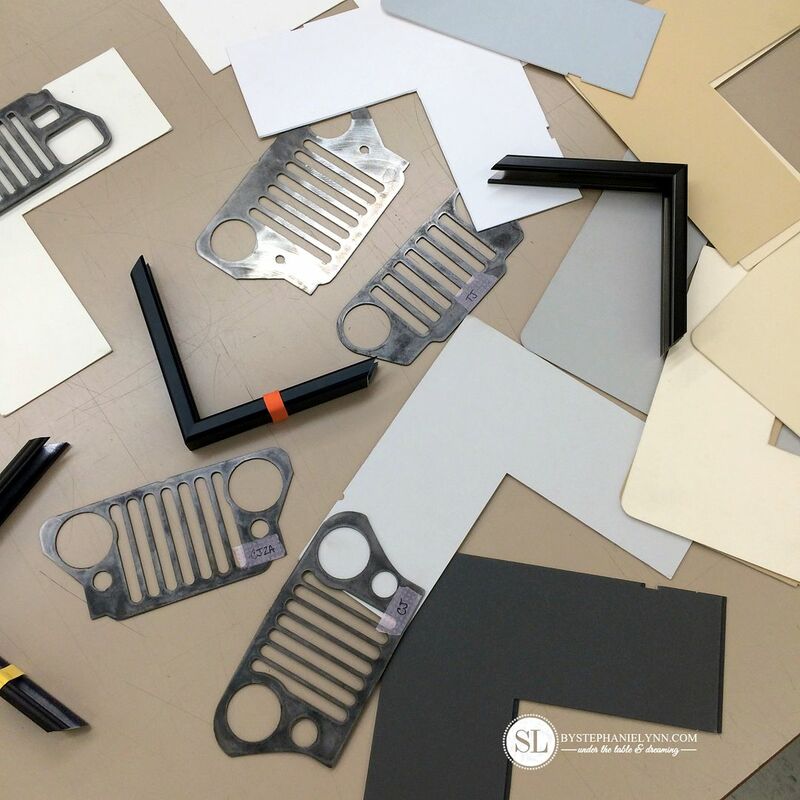 Shram Fab specializes in custom metal fabrication carrying a full line of signs, shelves, art, and accessories. 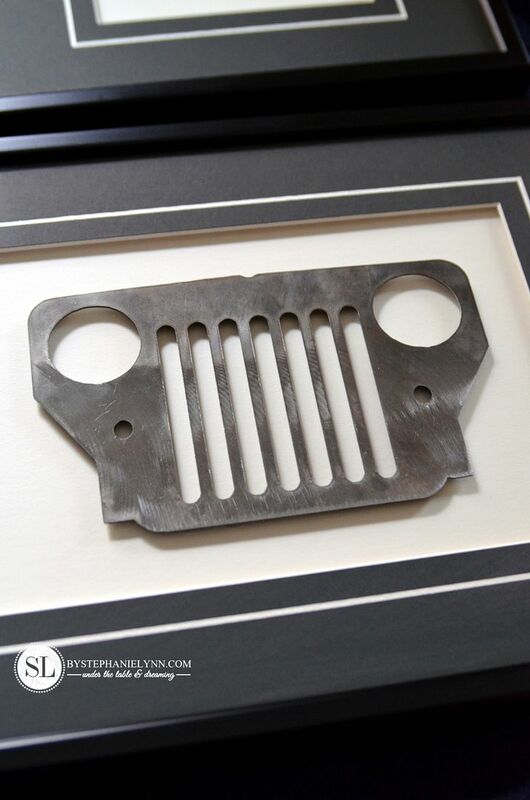 Among my favorite pieces in his shop are the plasma cut replica Jeep grilles. 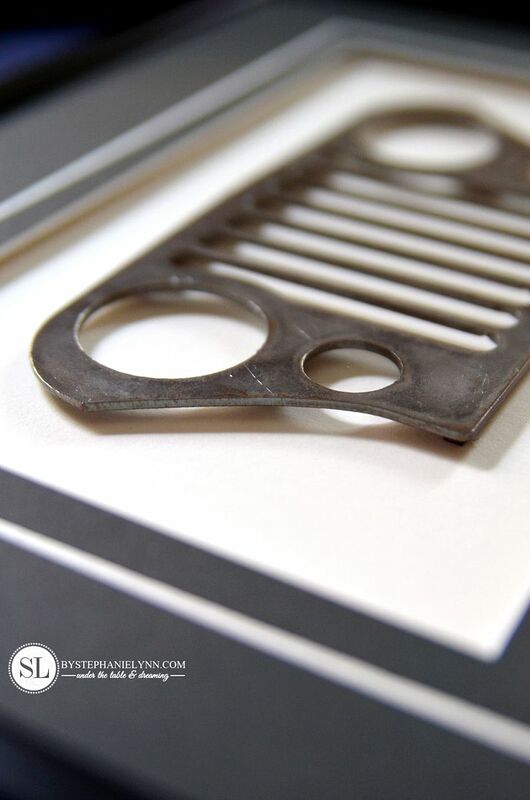 My idea was to showcase the evolution of the ‘notorious seven slotted grilles‘ by having a series of them framed. 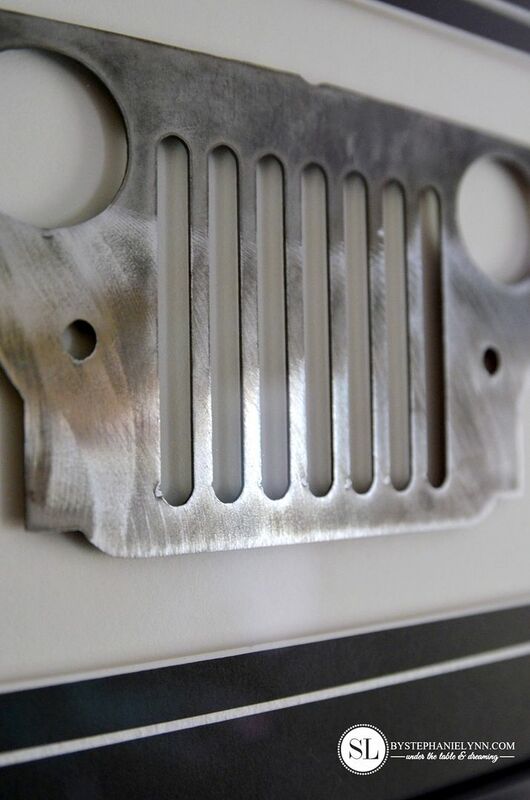 The 8 inch mini Jeep grilles are listed in the shop as key holders – however since they are custom cut they can be ordered without the key tabs. 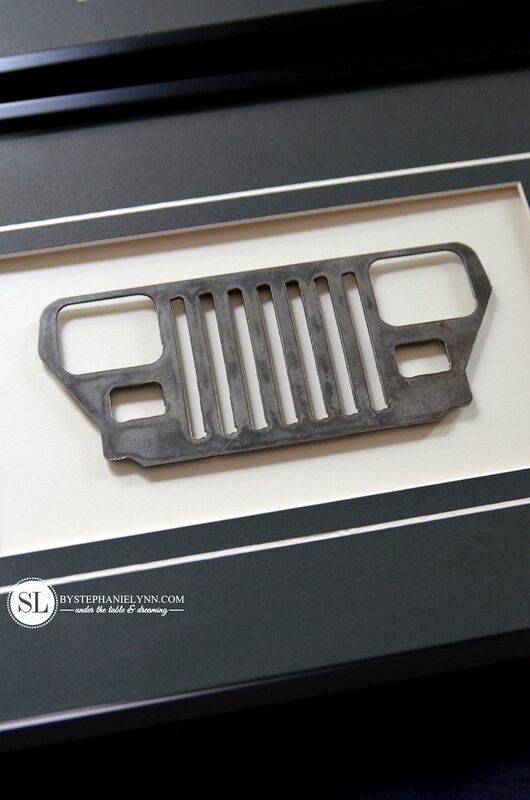 They are available in a variety of finishes – though I just love the authentic look of the raw steel. Once they arrived I headed off to our local Michaels . Last year I had the chance to experience Michaels Certified Custom Framing first hand when I Framed Toy Story Dolls for our little guy. 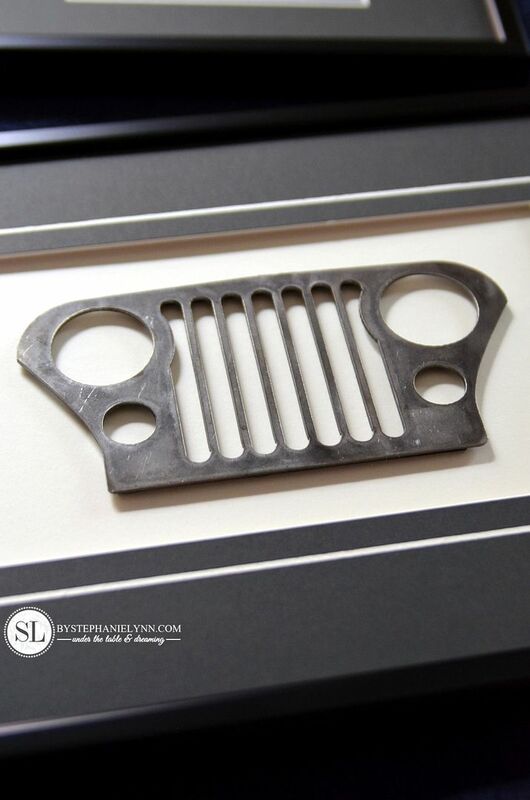 I was so thrilled with the attention to detail and level of care we received I couldn’t wait to drop off the Jeep grilles. 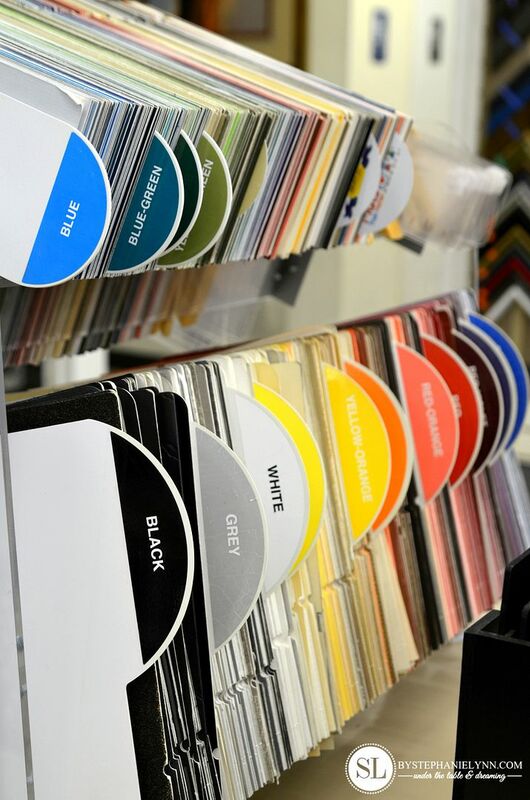 Taking an idea to the custom framing counter can be a bit imitating but I can not say enough about the certified professional framing experts at our local Michaels Store. This time around I met with Kimberly and Sheldon who walked me step by step through the design process and seamlessly brought my vision to life. 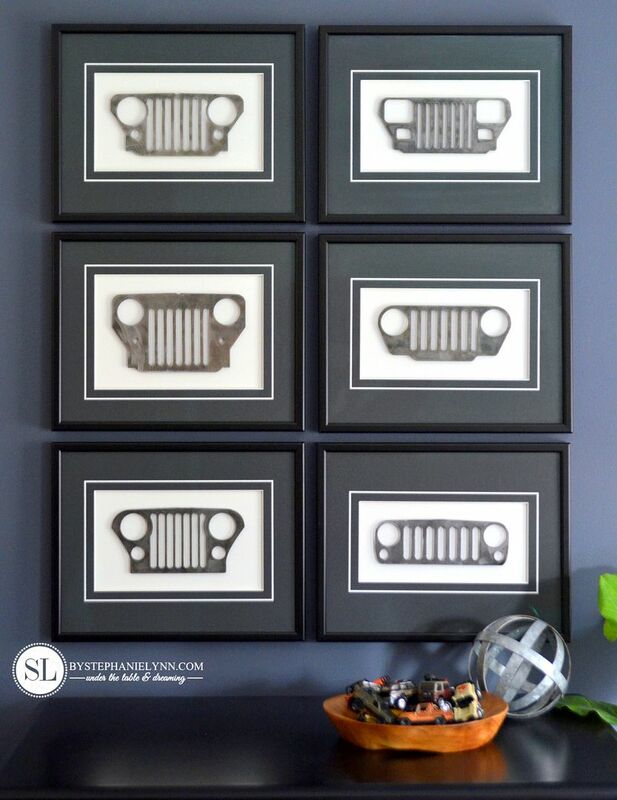 I had the opportunity to frame all six pieces using a fantastic framing deal Michaels has put together for the upcoming holiday season. During this special offer any photo or piece of art, up to an 8X10, can be custom framed for just $49. 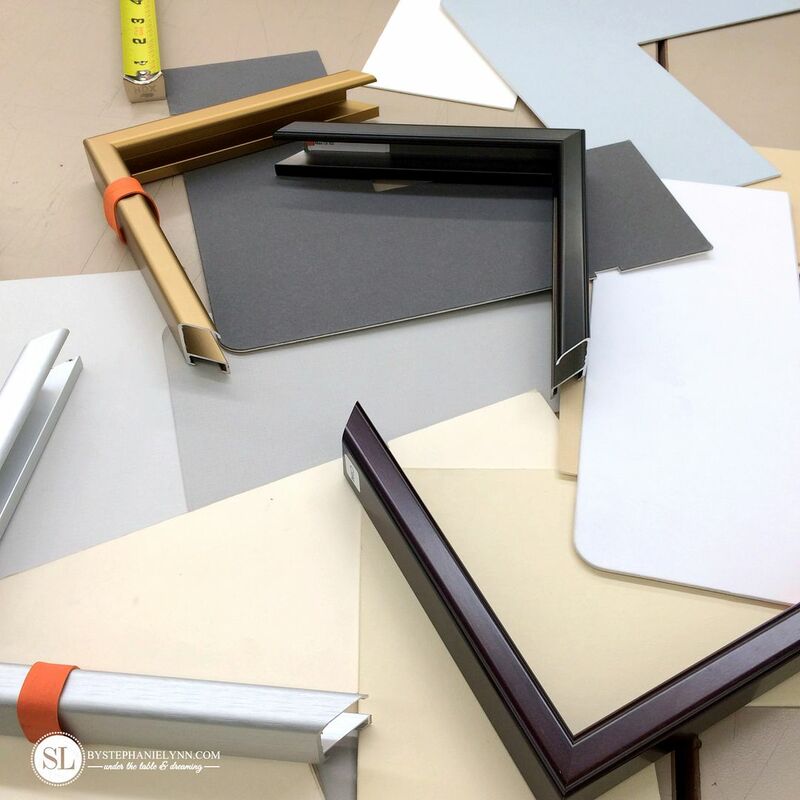 The offer includes a choice of 9 metal frames and over 100 different basic mat colors. I always think I have a pretty good idea of what I’m looking for when I walk into the store, however seeing all of the choices laid out in front of me on the counter still makes me a bit indecisive and overwhelmed. That is where the benefit of working with a custom framer comes into play. Kimberly and Sheldon both listened and took into consideration the overall style I was going for to help me narrow down my choices. 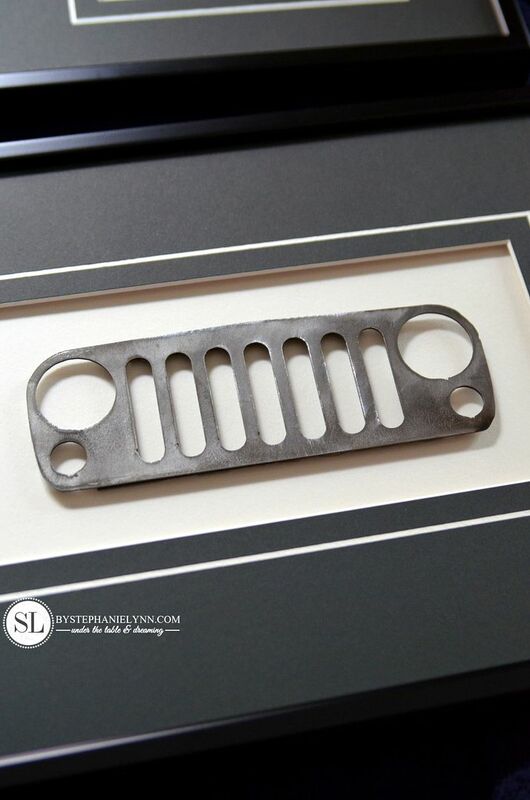 Collectively we chose to mount each Jeep grill on a matte white background, with a coal mat, in a matte black metal frame. 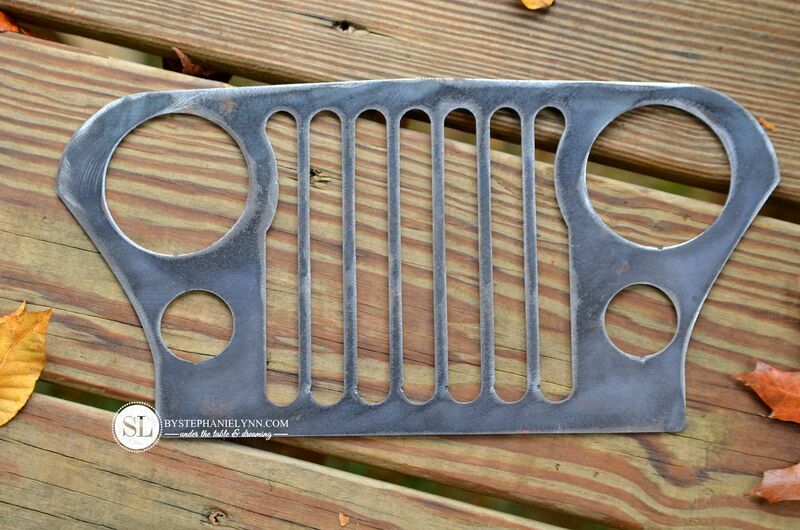 To add some dimension to the pieces, Kimberly suggested bumping out each grille using spacers. 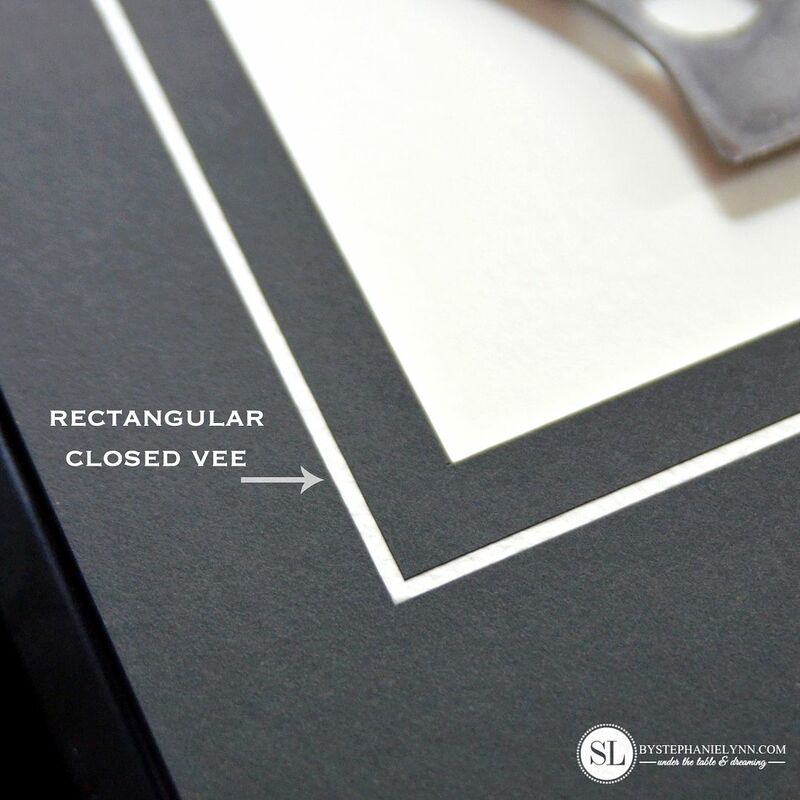 She also suggested adding a rectangular closed vee cut to the coal mat. This cut is the white space shown above which gives the illusion of a double mat and breaks up the darker colors. I loved the suggestions and was on board with both of her ideas. Just a few perks that come along with working alongside the certified professionals. The only other addition I opted for was the masterpiece acrylic. I raved about this ‘glazing option’ when we Framed the Toy Story dolls. The photo above and all of the photos below are taken right through the acrylic. The masterpiece acrylic reduces all of the reflections and glares typically seen with regular glass – and the clarity is absolutely amazing. It is also lightweight and shatterproof which – safety wise – is a no brainer for any piece of artwork hanging in our little guy’s room. 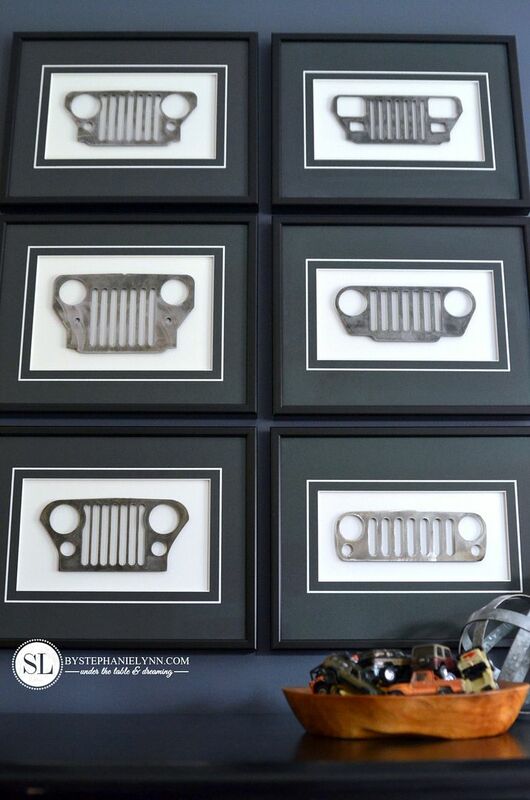 We are thrilled to say the least with this set of framed Jeep grilles. The finished size of each frame measures 15 inches x 11 3/4 inches. 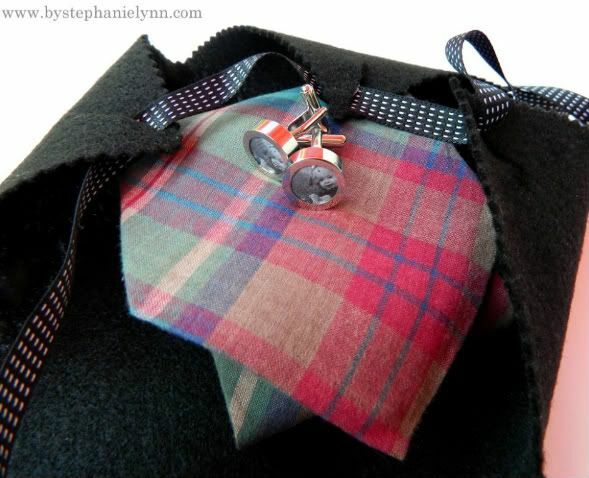 The small details really capture and showcase the rich heritage in each piece. 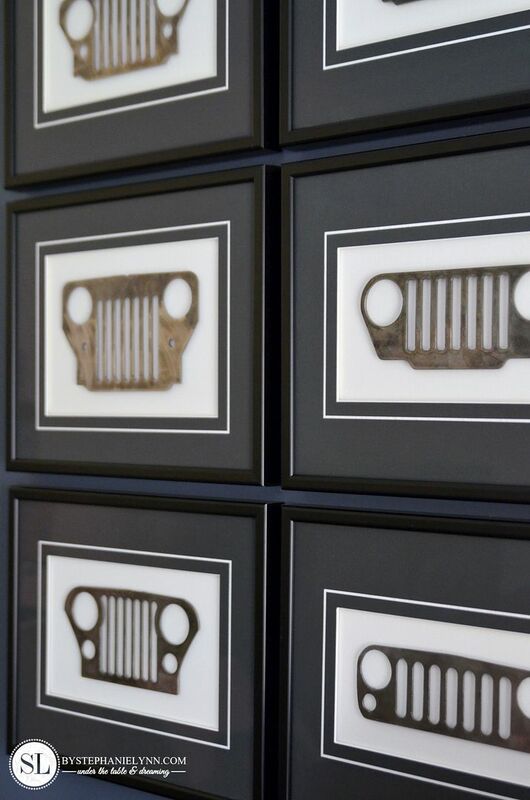 While CJ loves the idea of having his own set of Jeeps – ‘the ones parked right on his wall’ – Butch was impressed with the frames even more. It looks like Santa will be paying another visit to Shram Fab and Michaels once more. This post is brought to you by Michaels . The opinions read here are entirely my own. Get a jump start on your holiday shopping this year with Michaels . 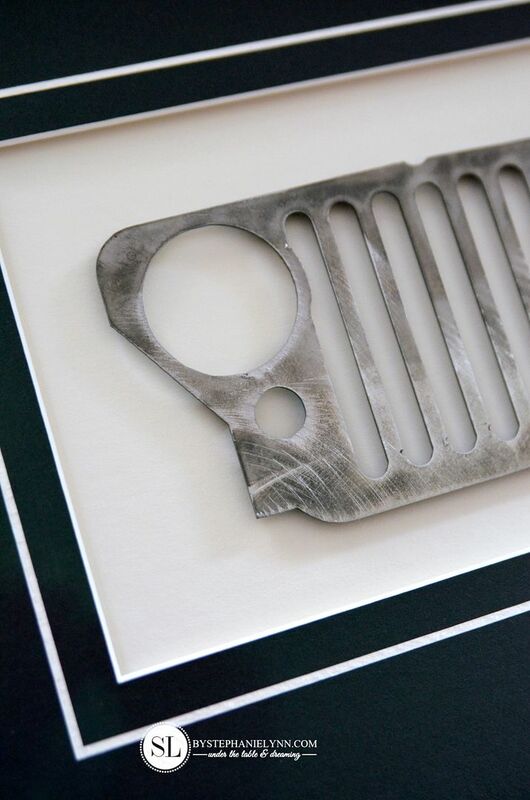 Let the Custom Framing Experts help you design a one of a kind gift this season for someone special – Custom frame any photo or piece of art up to an 8×10 for just $49! (certain restrictions apply) Happy Holidays! Oh my goodness! How awesome are those?? 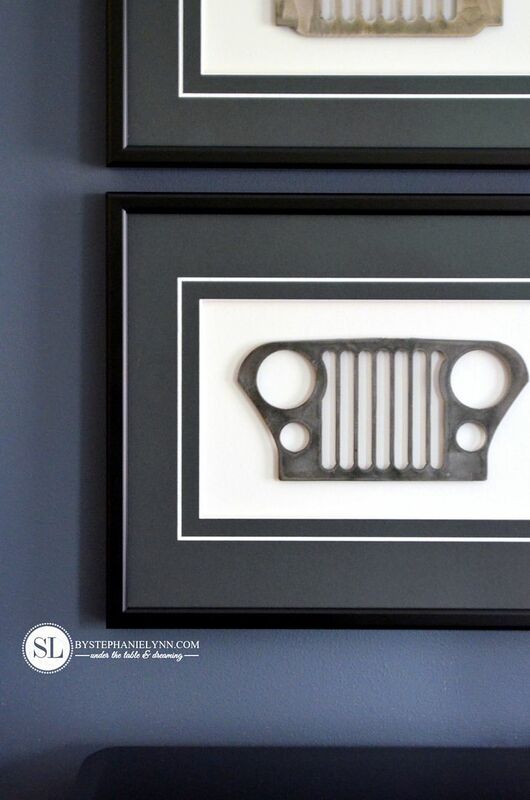 We are a Jeep family and completely understand! We’re expecting baby #2 & this makes me hope it’s a boy just so I can order some of those grills!!! LOVE!!! Yes very awesome! Such a great idea!